It's been a while since I've had a nice thick slice of chocolate cake. I used to crave the stuff all. the. time. But for some reason for the last couple of years, I've been more and more into pies and such. This new obsession has left my long lost love- the chocolate cake, in the dust. I'm sorry chocolate cake. Please forgive me. Not just any chocolate cake either. 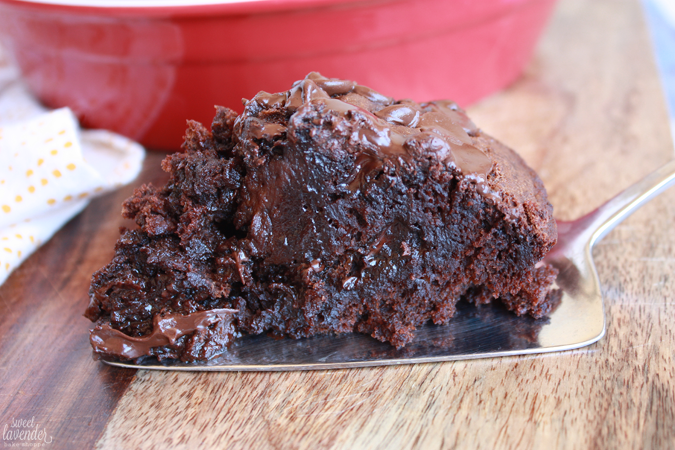 I need a big huge slice of warm, gooey, moist chocolate cake. One that you sit back and get comfy and eat reallllllllly slow. Preferably dripping in homemade chocolate ganache or fudgy frosting. Holy cow. When I stumbled upon this recipe a few months ago, the pictures alone made my mouth water. It looked so moist, so gooey and chocolatey, that I left it open on my tabs bar immediately. "I'm going to make this ASAP!" I said to myself. And there it sat. Forever. Then we had company come into town. I knew I needed to have something lovely for them to indulge in while here, because you know- awesome hostess and stuff. I also had a stash of overripe bananas in the fridge. It's like I was supposed to make this thing or something. So glad to finally check this off the list of the 2 million recipes I want to try! I tweaked the recipe just a tad to fit what I had on hand and also because I wanted to make a little more than the recipe provided. Neatest part? 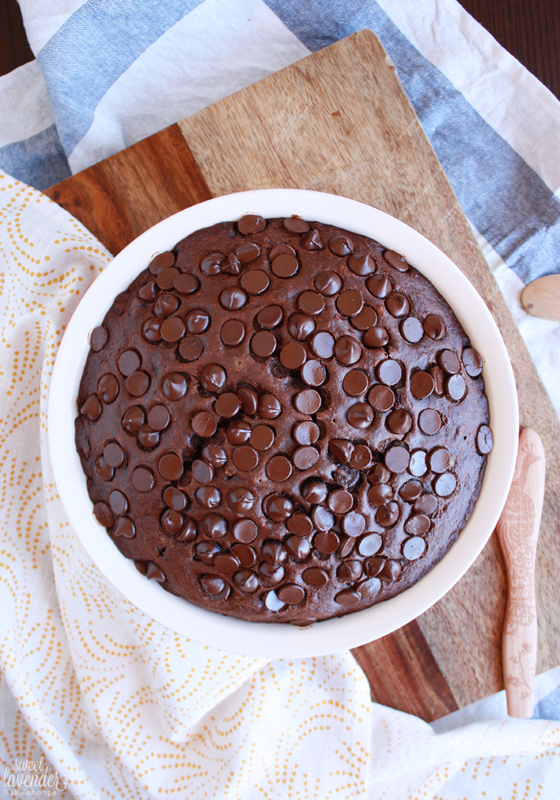 This recipe is oil and butter free, egg free, dairy free (if you find dairy free chocolate chips) AND is made in one bowl. NO mixer needed! Wheeeee! All you need is a whisk, rubber spatula, large mixing bowl and your arms. 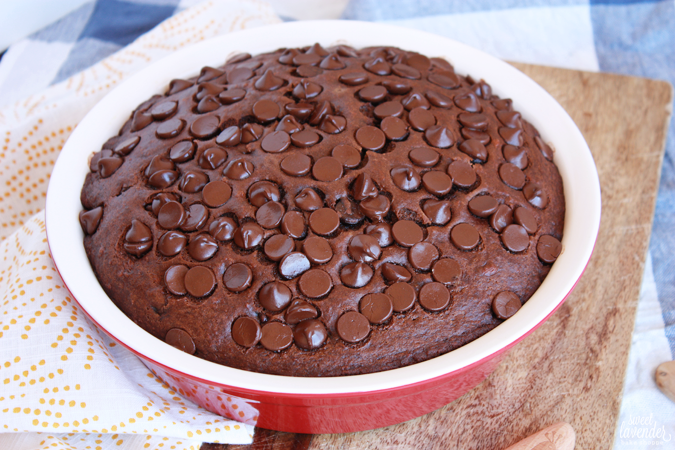 It's chocolately to the max, super moist and fudgy, with a hint of banana flavor throughout. It's seriously the bomb.com. Did I just say that? 1. Preheat your oven to 350°F and grease a ceramic or glass deep dish 9" pie pan with cooking spray. Set aside. You can also use a 9" cake pan. Make sure you follow these tips to ensure your cake doesn't stick to your pan. 2. In a large bowl, mash together the bananas into a nice puree. Add the sugars, applesauce, water and vinegar and whisk together until completely combined. 3. Sift and whisk in the flour, cocoa powder, baking soda and sea salt. Mix until combined. 4. Stir in 1/2 of the chocolate chips. 5. Pour batter into your prepared pie pan and smooth out the top. 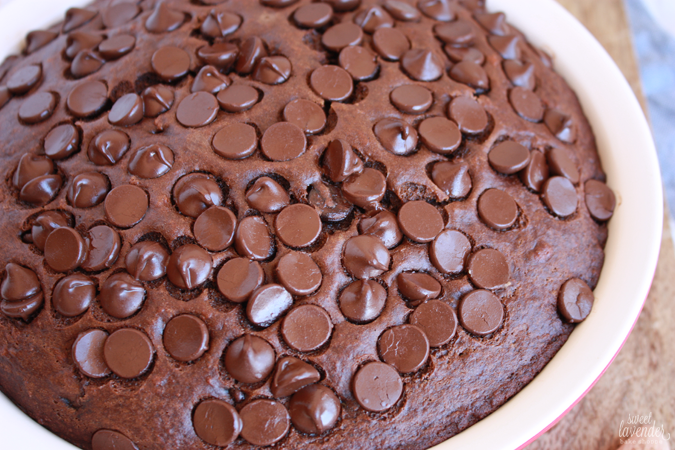 Sprinkle remaining chocolate chips over the top and place in the center of your preheated oven. Bake for 60 minutes or until a toothpick inserted in the middle comes out almost clean. 6. Let cool 15 minutes before serving. **Since there are no eggs in this recipe, it's best to bake cake until it's just about cooked through. This ensures a nice moist and really fudgy consistency. Cake can also be made a day or two in advance. Simply allow to cool completely before wrapping well in plastic wrap and placing in the fridge. On the day you wish to serve, remove from the fridge and allow to come to room temperature before serving. This sounds amazing beyond words! So hope you can make it and like it!